Freediving fins. Typically LONG bi fins. In laymen terms, long fins for each foot. There are freedivers that use mono fins which are single short fins that really make you a mermaid (both feet sharing one fin) but its use is a specialty and usually taken on by advanced divers. Long freediving and mono fins are not just coveted for the graceful look they give in the water, they’re also required for their “kick” as freedivers rely on their body to go deeper and further. Low volume mask. Freedivers need a mask that covers the eyes and nose, yet doesn’t take up too much space around the lens area. Freedivers don’t have the luxury of as much time or air to equalize (neutralize the pressure in ears and sinuses) while going deeper – hence low or less volume. The easiest explanation I can find is that it sits between a scuba mask and swimming goggles in terms of structure and look. Snorkel. For freediving, the simplest (and often times, the cheapest!) at the shop is what freedivers need. Freedivers need a snorkel that can help them breathe easily while they relax before removing it from their mouth to equalize and go down. Anything fancy with purge valves or wave guards create unnecessary hassle such as drag for a freediver, at the expense of streamlined immersion in the ocean. Weight belt with weights. Used to counteract the buoyance of free diving gear. For scuba divers that constitutes neutralizing the buoyance of scuba tanks and suits. Free divers need them just as much as, believe it or not, humans are quite buoyant if and when they allow themselves to relax. It actually takes a lot to get to a comfortable point of submersion in the water. Weight belts for divers in general have to be easily releasable in case of emergency and the weight “carried” by a diver is a moving target depending on depth, water property and other factors. Wetsuit. For comfort, protection (from temperature, bites and other harmful organisms in the water) and style. There are specialized wetsuits for freediving but I don’t intend to get technical about it. This is more a “nice to have” than a necessity in Brunei as I know quite a few freedivers who wear some form of rash guard or even just their swimsuit when they go into the ocean. Gloves and Socks are also very useful as heat escapes fastest through our extremities. The times that I got bitten by sea plankton or jellyfish toxin and even got sunburnt were when I wasn’t covering my skin much. My hands are still trying to recover from all sorts of rashes and burns. Buoy and Line. Freedivers go up and down considerably to rest before and after they hold their breath when diving. A good-sized, flat and distinct buoy with a rope line that extends to the depths is both a practical and safe option as a rest stop on the surface. Marker. To indicate that there are divers in the vicinity. Buoys can usually serve as a marker but there are also specialized flags or inflatables that inform fishermen or all sorts of sea goers that there are humans below them. Cutting tools (Knife, Shear or Line Cutter). Not just to appease you from any possible sea creature attacks, but to remove yourself from entanglement of nets, lines and even seaweed. My hand got caught in a fishing hook barely a few metres away from the surface in one of my earlier scuba dives. It’s left me quite weary ever since. You’ll see me donning a knife dagger on my leg when I’m out at sea now. All-in-all it’s not meant to be an expensive or restrictive activity. Really freedivers can do with just a mask and no snorkel as they may have other ways of relaxing on the surface. Same goes for fins – they have only become a necessity for (aspiring) freedivers as humans have learned to incorporate scientifically backed and trendy methods of getting around the ocean as efficiently as possible. There are those who go into the ocean without the aid of fins and just swim around holding their breath, with only a simple goggle or mask at tow. No weights, no wet suits. Bajau or Sea Gypsy style. 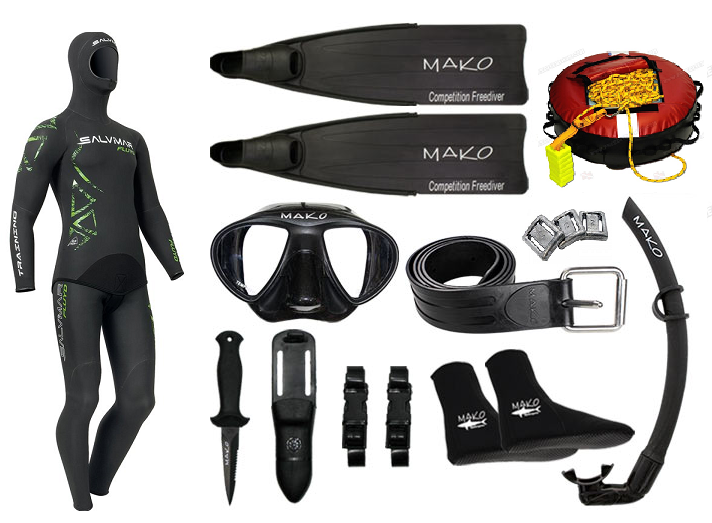 The vanity of humans plays out with the spurt of dive equipment showrooms and online shops sporting all sorts of brands, styles and colours for each and every possible item you could have for freediving. I will share where freediving equipment can be purchased in or from Brunei in one of my upcoming posts. I’ll also divulge where and how people can get started – mostly anecdotal from first-hand experience. Previous Personal Best: Mental Blankness. Oh, and 20 meters down.